IT WAS a tough negotiation. The BBC fought long and hard. Not, you understand, over responsibilities or hours or pay or any other such trivia. No, this was much more serious. Naturally, I was reasonable throughout. If it's not to be the Daleks, I said, I'll settle for the Cybermen. How could I possibly go home and explain that even though we'd watched Andy Marr with the Slitheens, the job of BBC Political Editor did not include a cameo role in Doctor Who? Taking over from Marr is almost as daunting as it must be for David Tennant replacing Christoper Eccleston as the Doctor. Both men have become broadcasting icons in remarkably short order. Both men, it has to be said, have remarkable ears. One of the first congratulatory e-mails I received inquired: "Does this mean you have to have ear extensions?" It was not in the job spec, but who knows? Perhaps political editors, like Doctor Who, should .not retire. Instead, they should regenerate. Out goes Big Ears. In comes Big Specs. What do you mean, it would never work? It has been an emotional rollercoaster of a week. Excitement at securing a big job has been marred by feelings of guilt and uncertainty at my infidelity to friends and colleagues at ITV News. On Monday, the day I announced my desertion, I spoke to a gathering in the newsroom. I said that even though this was a challenge I couldn't resist, I was leaving permanently infected by ITN's chippy, cheeky and passionate approach to journalism. Then, rather like a B-list f actress accepting an Oscar, I blubbed (ever so slightly, you understand). Ever since the act of vandalism that took News at Ten off air, ITN has suffered from neglect by the chattering classes. Even so, millions have enjoyed and been enlightened by brilliant reporting, such as that of the war in Iraq, the tsunami and, this week, from Zimbabwe. Good journalism thrives on fierce competition. I shall strive to beat my old colleagues every day and shall raise a glass and toast them every time they beat me. Reactions to my appointment have, shall we say, varied. I bumped into Tony Benn in Parliament. He beamed, shook my hand vigorously and congratulated me on getting "a very important job". 'He said: "You get to stand outside No 10 and tell the world what you heard from inside ten minutes before. I call it 'embedded reporting'." The old veteran chuckled before striding off. That same day Polly Toynbee, of The Guardian, labelled me macho, which provoked hilarity from my wife until she read on and realised that it was very far from being a compliment. There are many legitimate concerns and debates about how politics is covered by the BBC and others. How do you question and challenge those in authority, as Tony Benn wants, without corroding trust in our democracy, as Polly fears? The question is easier to pose than to answer. For my part, I will aim to be sceptical, not cynical; to question, not to hector; to analyse, not to opine; to examine policy, not just personality; to persist, not to give up easily; to explain, not to obfuscate; to excite, not to bore. I plan to pin a notice above my desk reading "Remember Tony & Polly, stupid." APA 6th ed. : Robinson, Nick (2005-06-25). I'm prepared for my role as BBC Man, but how to fit Big Specs into the new Dr Who?. The Times p. 38. MLA 7th ed. : Robinson, Nick. 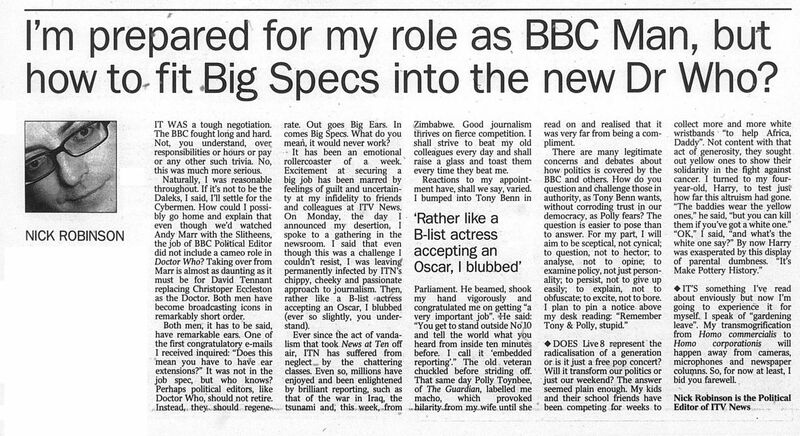 "I'm prepared for my role as BBC Man, but how to fit Big Specs into the new Dr Who?." The Times [add city] 2005-06-25, 38. Print. Turabian: Robinson, Nick. "I'm prepared for my role as BBC Man, but how to fit Big Specs into the new Dr Who?." The Times, 2005-06-25, section, 38 edition. This page was last modified on 25 June 2015, at 23:20.